New from the editors of Whole Living (a Martha Stewart Living publication) is a cookbook with 150 feel-good recipes that use only the healthiest ingredients. The book is the first for Whole Living magazine and is called "Power Foods." It was released on December 28th in the U.S. and Canada and has a foreword written by Martha Stewart. 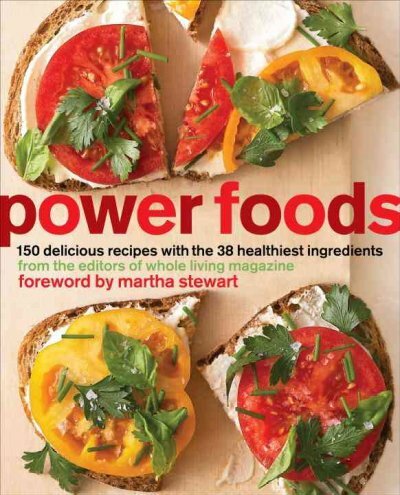 Beyond the recipes, the editors include research-backed information about the health benefits and disease-fighting properties of 38 power foods, along with nutritional data and helpful tips on storing, preparing, and cooking them. In this one-stop resource, you’ll learn all about stocking a healthy pantry, eating seasonally, understanding food labels, and when it’s best to splurge for organic ingredients. I can't wait to pick up the book. Thanks! I have had this book for about a month, the recipes are outstanding, given me new reasons to explore new healthy foods I previously avoided.